The Kelly Branch stream system was in trouble. Three utility line crossings were impeding fish passage, and active erosion, channel migration, over-widening, and the lack of a riparian buffer along a significant stretch kept the system from thriving. 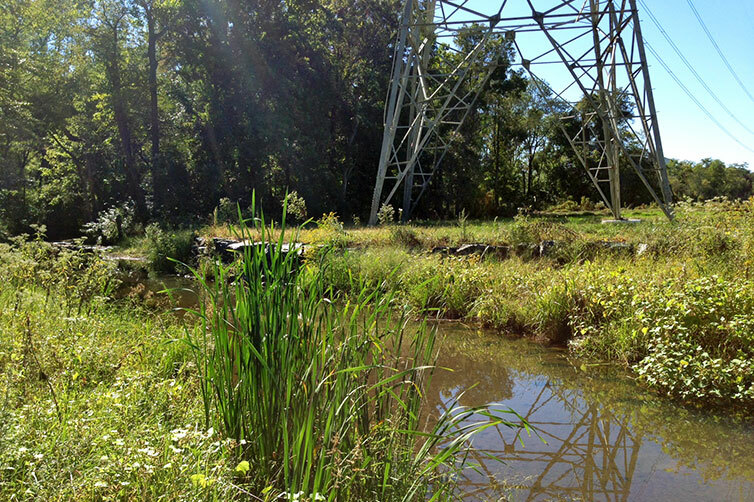 As part of an open-end contract, Century and its JV partner assisted with the assessment and restoration design of approximately 3,400 linear feet of channel and the creation of adjacent wetlands to promote water quality improvements. 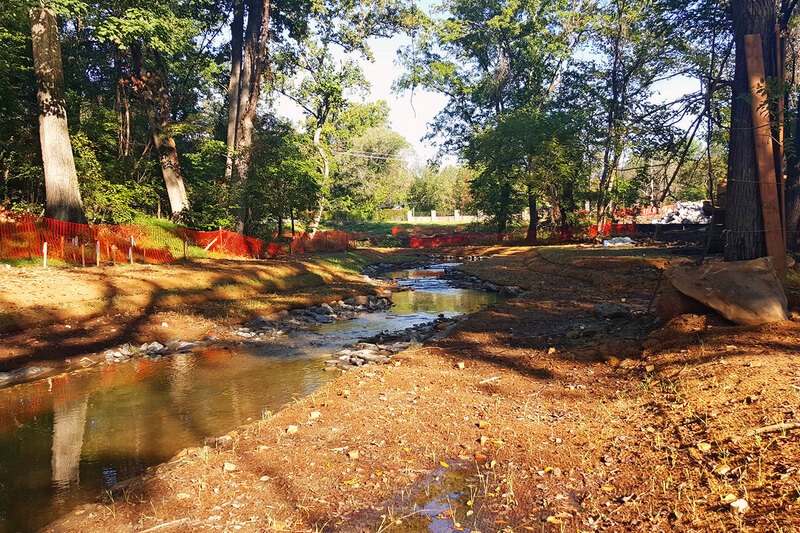 Century conducted a visual/limited geomorphic assessment of Kelly Branch to describe the fluvial and morphological characteristics for the project. During the assessment, significant stream and valley features assessed, photographed and located with a GPS unit included: debris jams, bedrock features, knick points, fish blockages, utility crossings, channel bars, riparian vegetation, valley constrictions and infrastructure. Special attention was paid to features indicative of bed load movement and sediment transport. To achieve the project goals, Century first developed a 15 percent concept using GIS to illustrate the initial design approach, limits of disturbance, and possible alternatives. As the design team moved forward into the 30 percent design phase and modeled existing/ultimate discharges for storm events, it became clear that adjacent properties were too close to allow the degraded stream system to be reconnected with its historic floodplain. As a result, the design approach shifted to creating a self-sustaining system that minimized risk of future flooding. To reduce risk of future flooding, increases in the bed elevation to provide fish passage was balanced by an overall increase in the top of bank channel dimensions. Constructed riffles provided backwater over the sanitary lines and mitigated against excess bed shear during higher flow events, and an extensive planting plan was proposed to help re-establish a riparian buffer throughout the stream corridor, providing a self-sustaining stream system for long-term stability. 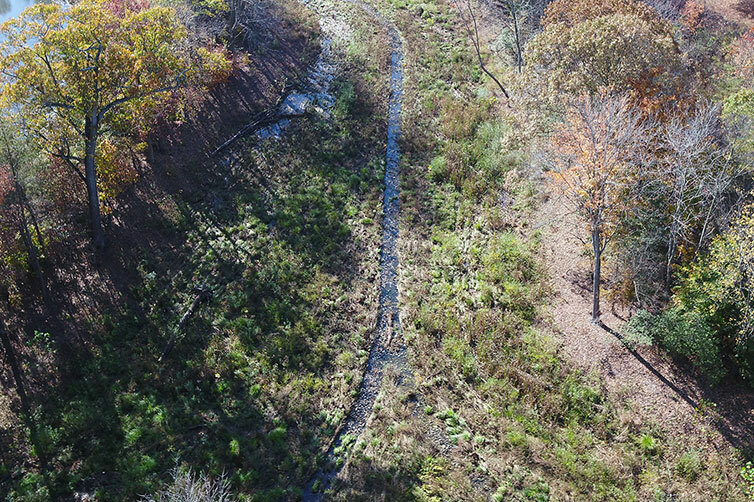 Additionally, a storm water outfall tributary with an imbricated stone drop structure was used to reduce energy and lower the stormflows before routing them though a large wetland cell, providing habitat diversity and water quality treatment before flows entered Kelly Branch.